One of the challenges associated with APIs is having more and more folks be able to use them, without the often requisite sophisticated programming knowledge and experience. Interactive documentation tools, like IO Docs and Swagger UI, have been great ways for helping developers learn about APIs. But what about having people - non programmers - use APIs to accomplish day to day tasks? Imagine that! How to best get them productive all the while not having to spin up big application development projects? 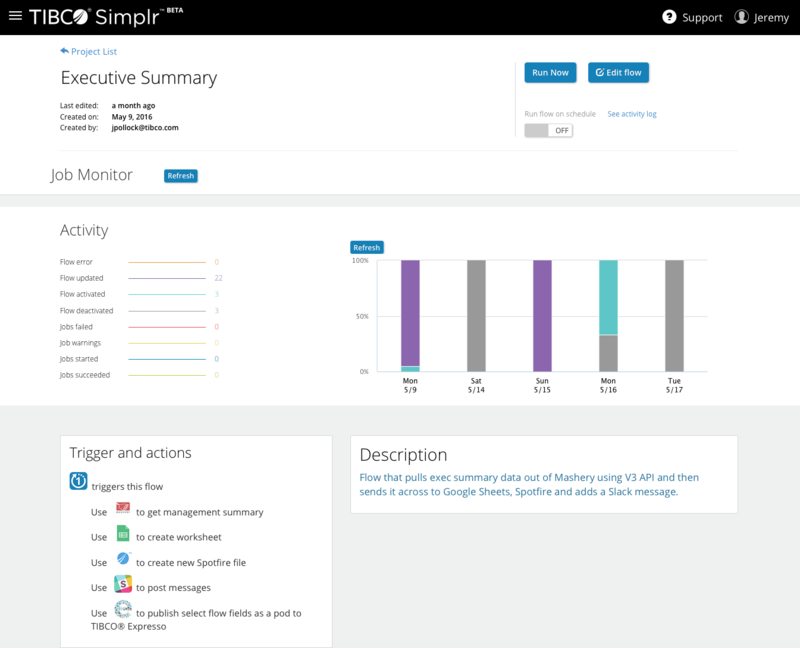 TIBCO Simplr™ is a great way to get API-driven useful capabilities into the hands of business managers. 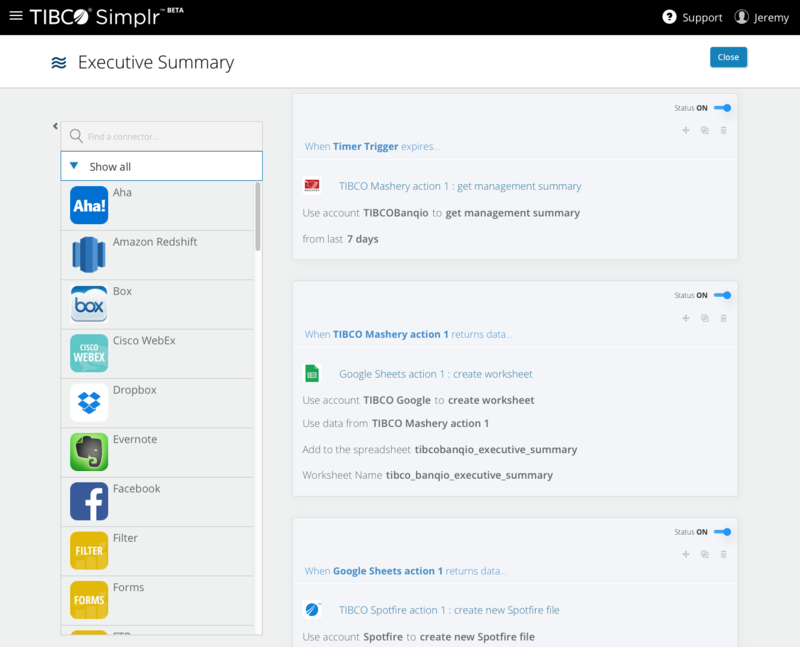 TIBCO Simplr links your cloud apps and automates tasks so you can get your job done faster and more accurately. Whether you’re planning a sales trip, reporting on marketing campaigns, surveying employees, or just trying to improve your productivity, Simplr can help you and everyone in your organization. How does this all fit into TIBCO Mashery? Well, we're pleased to announce the availabilty of the TIBCO Mashery Connector for TIBCO Simplr. TIBCO Mashery customers can now leverage a very simple tool to do things like pull developer data out of Mashery, previously only accomplished using the Mashery API. Now you can do things like pull out developer data and put into a Marketo app or a Google spreadsheet or drive a SurveyMonkey product feedback process. All without programming! Sample screen shots can be seen below. A quick demonstration of the feature can be found here and here. NOTE: The use of the TIBCO Mashery Connector for TIBCO Simplr requires a Mashery V3 API Key. Please visit here to get one. TIBCO Simplr is free right now in Beta. Sign up to access Mashery connector templates, or build your own!